Gate Repair Gardena | (310) 694-9782 | Trusted, Reliable and Affordable! Garage door Gardena has a sister division called Gate Repair Gardena where we offer expert, affordable, reliable and professional gate installation and repair for your home and business location. Our technicians are available 24/7 for any gate issues that might arise and we back up our work with our 90-day, 100% money back guarantee. 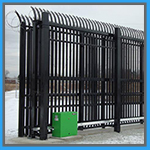 If your gate sees a lot of traffic, then you can’t afford for it to go down for any period of time whatsoever, and in the case of business gates, it could really affect your bottom line, which is definitely not what you want at all! We offer 24/7 emergency gate repair service, too! If your gate at your home or business isn’t working the way it’s supposed to, we’re the people who can do something about it. We’re licensed, insured and bonded, and we’re here to help you. Having a garage door makes a statement about how much you value safety and privacy and so do we. Call us for more details!